Stripped down hive #2 today to see if I could find out why the colony collapsed. Good quantity of honey in super, although not as much as I'd expected to find, and very little in the brood chamber. The bees were all in the brood chamber head down in the comb cells, looking for food. What was apparant was than much of the honey was solid white, which the bees seem to have been gnawing, and other cells had a darker solid honey. No sign of larvae. They seem to have starved even though there was food, for some reason they didn't go up for it. And my big mistake was in assuming that the honey I'd left them was the right sort to get them through the winter. I vacuumed out the dead colony, cleaned up the hive and put it all together again in the same spot in the garden but in a bin bag. No room anywhere else for it. Now concerned that I've misjudged the supplies in the other hive so gave them some syrup in a feeder, they may not take it with the temperature being so low but nothing lost. Checked hive #4 by taking the top off and could see plenty of bees crawling on top of the super frames, even though the outside temp was around zero. Gave them some solid food via the hole in the crown board..
No sign of bees around hive #2 for some time so investigated with a torch and could see a pile of dead bees on the hive floor. A collapsed colony. Seems to have died on 18th Dec from the charts. Both hives treated with oxalic acid fumes. Super very full. one centre capped frame removed, others moved up and an empty frame put in at the end. Brood box also full, plenty of stores and brood and I saw a few larvae so put it together. Excluder removed. This is the first time I've been in since combining the two colonies and what I encountered was dozens of rear end bee shells. I guess these were the drones that couldn't get through the excluder, looks like they had their heads chewed off. This is the most aggressive reception I've ever had so I did the bare minimum. A very unpleasant experience made all the worse by four bees getting into my hood. Subsequent inspection has revealed a parting in a seam. At least I can fix that and hopefully stop it happening again. in the event they stung me three times (through the suit!) on my arm and once on my neck. It could have been a lot worse. The weight with the super off shows 8.5Kg which has to be wrong. If I take hive #2 figure of 17.5Kg then there is an error of 9Kg. The super weight is 18Kg, down to 17 Kg with one frame removed. So I reckon they have about 25Kg stores. I really should take out half a dozen capped frames but am loath to go in there again for a while. I've been concerned about wasps getting in. With such a strong aggressive colony pity the poor wasp that ventures near. Super end frames have plenty of space for more forage should they need it. Excluder removed. Good stores on first two frames in brood chamber, brood and larvae on 3rd frame, left it at that and boxed them up. Drop board inserted. Looking at the weight trace, the brood alone with the super removed was 17.5 Kg so some 10Kg of stores in there. The super weighs 12.5Kg so about 10Kg there also. They seem well set for the winter and are pulling in forage again now that the ivy is in flower . I was watching the insects on the ivy, there are bees, wasps and bumbles feeding on it. And feeding on these are a plague of hornets. They simply pounce on a feeding bee and chew it up in situ. Hopefully they are chewing up wasps too. It would be interesting to know how many one hornet gets through per day. Three cleaned up frames taken off hive #3, two more frames added for cleanup. Wasps are really harassing hive #2, video below from this morning. Both entrances down to two bee widths. Trying to slim #3 down to a brood plus super, so removed the 2nd super. However they'd capped the centre 6 frames so I moved two of the down to the end positions in super 1, uncapped two others and left them to hopefully take down, and took two other away, possibly to feed back to them later. Super #1 seems seems to have about 8 capped frames. Weight now down to 25Kg. Hive #2 given a syrup feed and Beebug moved in to empty top super. Top super with cleaned up frames removed from hive #3 - bee population noticeably smaller now. Need to consolidate both hives for winter at 30Kg, both a bit low at 27Kg. Varroa drop one day after 3rd treatment is approx 20 for #3 and 40 for #2. 2nd super, that had frames for cleaning, taken off #2. 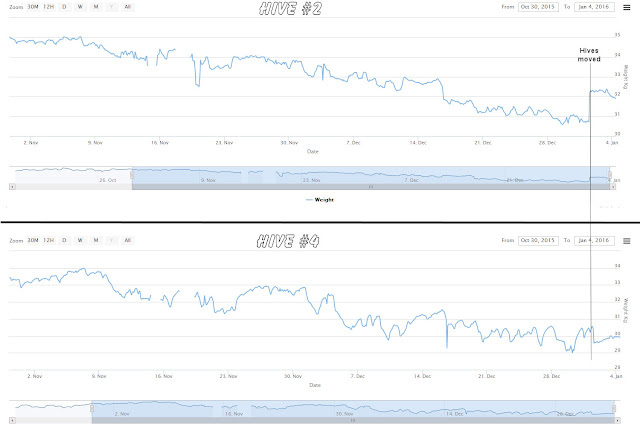 Mysteriously, Hive #3 dropped sharply by 2Kg at 10am today - was it a swarm? Must check for larvae in a few weeks time. Both hives given 3rd oxalic acid treatment. Hive #2 given a tub of cappings & honey, 3 cleaned up frames removed. Decidedly unfriendly! Drop boards removed, count seems to be about 80 on each. Second oxalic acid treatment on both colonies. Drop boards inserted. Hive #3 given a margarine container of cappings to clean up. Very unappreciative - stung me through my gloves! count was about 20 for #3 and 60 for #2. Had previously seen bees from #2 carrying DWV victims some 10ft away and unceremoniously dumping them. Then the wasps finish them off - nothing wasted in nature. But no bees crawling around the hives with DWV as I witnessed a year ago. the bin bag contained the fumes and I made sure I didn't breath in when removing them. From previous trials 2.5 minutes is enough to vaporise the crystals and then a further 5 minutes for let the vapor circulate. Added drop boards.Took the brood chamber off the top of #3 and put on a super with frames to be cleaned up. Brood box at top of Hive #4 taken off and placed near hive for a cleanout. Rest of hive moved on to weighing system and brood probe inserted. Later in day the brood temp reached 38Cand there were loads of bees on the front - possibly overcrowding, so brood box put back on again. I'll give it a few days to see if they take down the honey then gradually take out the frames. 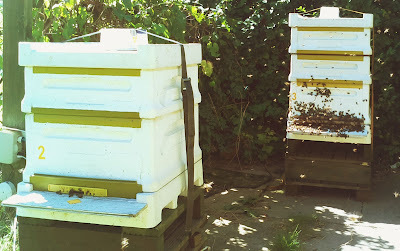 Need to get the hive down to brood + super for the Winter. Hive #3 - Changed end two frames (undrawn) for old drawn frames. Checked for eggs and soon found some on the 4th frame so all looks good. Queen excluder added in readiness for merge with hive #4. 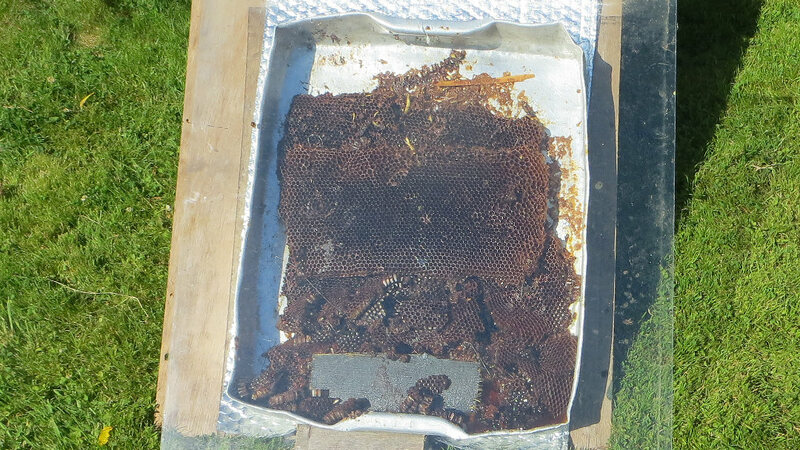 Hive #4 - a super removed ready for extraction.Weight drop from 42Kg to 28Kg. Hive #2 - first super removed ready for extraction. 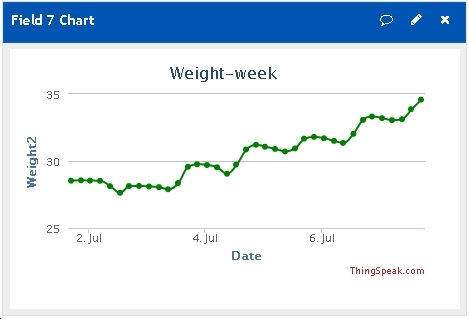 weight drop from 48Kg to 23Kg (something very odd here). Checked brood chamber and larvae on 3rd frame so I boxed them up. 7pm - hive #4 placed above hive #3 with two layers of newspaper. Crown board placed above 1st super to encourage bees to take down the honey. I'll either end up with a very strong colony or no colony at all. I think this is why beekeeping is so addictive - it's all an educated gambol but ultimately the bees call the tune. Back from holiday and checked hive #4, sadly no queen (no eggs/larvae or brood) so will merge into nuc #1, a few supers at a time so as not to overwhelm them. 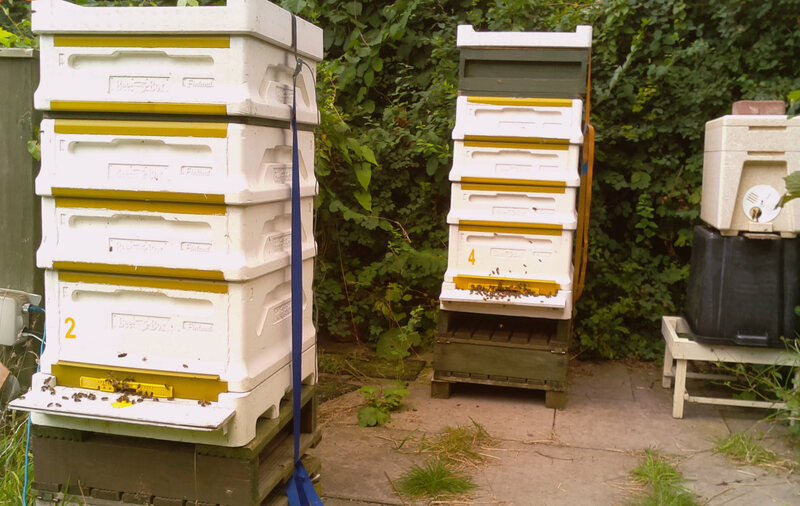 I'll call nuc #1 hive #3 from now on, as it's now a standard Beebox unit. Checked nuc #1 and there are loads of brood cells, they need a bigger home so I will move to a standard Beebox. Then decide if I need to combine hive #4 into it in a few weeks time. I think (looking at weight curve) that hive #4 swarmed on Saturday 6th - while I was away of course, they always wait for me to go away. So I went in expecting to have to remove all but two of the many queen cells that I saw a week ago. Went through super #1 and saw lots of larvae so the queen was there recently, There were also two queen cells which I knocked down. When I went throught the brood box there were no queen cells, they had taken them all down! So I cleverly removed the only two - feeling very annoyed with myself about that. So I don't know if there is a queen or not and they may not have the means of making one as I saw no eggs in either the brood or super #1. So all very unsatisfactory, and once again I should have just left them alone. Re-organised hive #2 to remove a super with about 10 cleaned up frames. A container of wax cappings was added to the top super (above the crownboard) for them to clean up. Temperature probe inserted at 1st super. Hive #2 now comprises brood chamber, excluder, 1st super (probably fully capped), 2nd super with plenty of space, crown board, top super with scraps. Re-organised hive #4 to move the wooden super above the crown borad and remove a super's worth of cleaned up frames. Also gave then a dish of wax cappings to clean up. Hive #4 now comprises a brood and a half, excluder, two supers (1st of which is about 80% capped), crown board, empty wooden super containing just the cappings. The 1st super had loads of brood, plus eggs and larvae. Couldn't see the queen but she's obviously been around. The brood chamber had brood but no eggs or larvae, and plenty of queen cells, which I left. So looks like she went up and can't get down again. Decided to move the excluder up above the 1st super to create a 'brood and a half' colony. Moved the temp sensor up to the 1st super. If the queen goes down again they may take down the queen cells. If they swarm so be it, overcrowded anyway, and that's without the large brood about to emerge in the 1st super.. The temp in the 1st super was up to 37C mid-afternoon and they were bearding again. Checked nuc #1 but no larvae yet, plenty of eggs. A little surprising as there were eggs there 4 days ago. Extracted the two supers taken off yesterday, then put a wet super on each hive and took off the second super on each hive. Major snag with #4 is that on the second super there were a load of brood (no larvae or eggs) on 4 frames. I put these to one side for the bees to rob out and spun the rest. I'll have to inspect properly to find out where the queen is, or are there two queens? - one above and one below the excluder. After extracting the second super the wet frames were put on top, so they now have two wet supers each. The first super is still untouched but I've had enough extracting for a while. Net crop about 33Kg. Doen't seem much for all the hard work. Hive #4 was bearding at 5pm when I went down and the brood temp had been up to 38C. Coming down again now. Just too many bees in there I think. The 3rd super was removed off each hive in readiness for extracting. Weight loss on #2 was 17Kg, on #4 it was 15Kg. Super and frames (empty) would be about 3Kg. Colony #2 very aggressive, #4 not so bad. Decided to take one super only at a time so as not to overcrowd the colony. One clever bee managed to get inside my beesuit, it's not nice having a bee on your face inside a suit. In the event it went for maximum damage and stung me on the eye. It swelled up a lot and hurt too. I think she got in where the two zips overlap for the hood. I've added extra velcro in the gap between the zips to try to prevent it happening a second time. A serious design fault. And Nuc #2 has gone to a new home in Wolverley today. Checkup on Nuc #1 revealed eggs and actually saw the large light coloured queen. Checked on nuc #2 and saw the queen again, this time darker. reached for my marker pen but she'd disappeared and I couldn't find her again. Lots of brood coming on, too much for the nuc so need to sell this colony. Checked honey situation in the two main hives. Top super on hive #4 about a third full and super 3 was almost too heavy to lift. Load cell trace shows 6Kg for super 4 and 12Kg for super 3, ie. about 9Kg of honey. 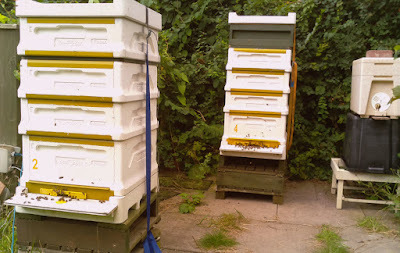 Top super on hive #2 only lightly filled but super 3 almost too heavy to lift again.. 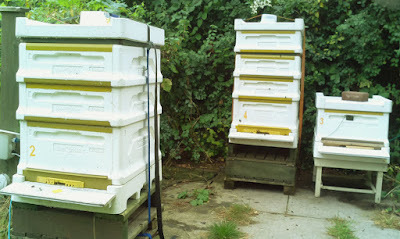 So need to pull off 2 or 3 supers worth from each colony, about 20/30Kg of honey. Hives checked for space. 4th super on #2 hardly touched. 3rd super of #4 getting full so added a 4th, which is a non-matching wooden super but it is only temporary so it will have to do. It added 5.8Kg (empty of course). So it looks like I can leave them to it for a good few weeks now. 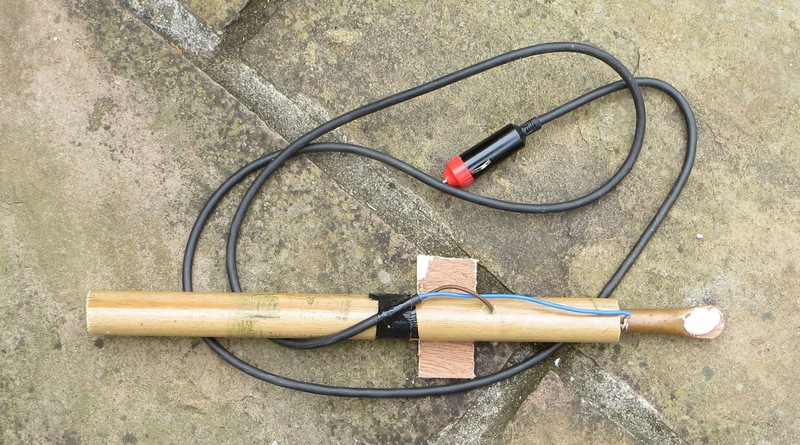 Temperature up to 35C today so assembled a solar wax extractor. Simply a set of odd bits from the garage:- plywood backing, a sheet of insulation, a metal tray, and a piece of glass on top. Angle for optimum solar energy, add comb and wait. Hive #2 beat all records for foraging today, weight up by 2.8Kg in 24 hours.Hive #4 only pulled 0.8Kg, I need to check if it's full. Nuc #1 swarmed at 10:30. I collected them straight into a nuc and then transfered the frames into my observation hive. I've been waiting for a swarm for this. Left a gap at the bottom for the many strays to enter by. Went back two hours later to box them up and they were gone! Will I never learn, this is the 3rd time that's happened this year. Searched for them in vain. Anyway, inspected nuc #1 and removed all but one queen cell. the one I left actually had the queen chewing the cap off so I know it's a good cell. Just hope I haven't missed another one or there'll be another swarm. Both main hives are still pulling well, I suspect it's Himalayan Balsam, must go for a walk tomorrow to see if I can spot them foraging. Hive #2 had 2Kg of bees out at mid-day, and managed to bring back over 2Kg. Acquired more super frames off another beekeeper and planned to remove 2 supers for extraction off each hive. However having taken a few frames off #2 I don't think they are ready, not yet capped. So added a super of undrawn frames on #4. Weight of base only was 20Kg, the new super with frames adds 3Kg. The three almost full supers weigh in at 12Kg each, so that's 9Kg of honey, about 20 jars per super. Checked the nucs to see where the queen is - she's in #2 which has brood, larvae and eggs. Nuc #1 still has a lot of brood but no larvae or eggs, and there are plenty of queen cells so boxed it up and hopefully they'll produce a queen. Had a quick look into the two main hives as they are pulling in loads of food and I'm concerned about space. Hive #4 still has plenty of room on the 3rd super, but super 3 on hive #2 is looking pretty full. Need to source more supers. Both #2 and #4 pulling in about 3Kg a day between them. Below is the weight curve for hive #4, other much the same. Checked out the two nucs 5 days after the split. All a bit inconclusive as I couldn't see the queen and there didn't seem to be eggs in either nuc. Both nucs had plenty of capped brood and plenty of larvae. Both have plenty of stores. Nuc #1 seemed to have some very small larvae and was making loads of queen cells - which I left alone, as I don't have a plan it's best to let them do what a bee's gotta do. And nuc #1 has about 4 times the number of bees that #2 has. From the ouside #1 has a lot of activity whereas with nuc #2 the bees hardly ever venture out. By the time I return from holiday in 10 days time all will be clear. The recombining exercise seems to have gone well and I've now removed the top brood chamber. The frames have been cleaned up and looking at them I now realise they have loads of drone cells in a pattern indicative of laying worker(s). I found a comment on a bee website to the effect that combining such a colony with a good colony may work, but there is a risk that the laying worker(s) can kill the good queen. So far hive #2 is still looking good but I'll have to get inside and have a look when I get back from holiday in 10 days or so. Just as well I have a spare colony in nuc #1. I'm pretty sure there's a queen in nuc #1 as there is lots of activity, hardly sign of life on the outside of nuc #2 - hopefully they are preparing a queen cell. I've been feeding them both and #1 takes it all but #2 is not that interested. Colony #2 and #4 have taken off these last few days, pulling in 1.5Kg a day so I'll leave them to it. Hives #2, #4 both loosing weight this week - just not enough forage I suspect. So decided to check nuc #1 as it doesn't have stores. Just as well, loads of brood and eggs but little food. Actually saw the queen too - waved but she ignored me. One fully developed queen cell, in centre of frame, plus a few in work at the bottom so they are probably preparing to swarm. This colony is really strong but needs more space. Gave them a litre of syrup. LATER: I initially decided to pass the nuc colony on to someone on the KBKA waiting list but then read that once a colony gets the swarm idea it's almost impossible to stop it. So it seems unfair to pass on a colony in this state. For this reason I've now split the colony and it's in two nucs. Sadly I couldn't find the queen - for some reason I was sure I would. So each colony has eggs, brood and some food and I'm giving them both syrup. Hopefully they will sort out my poor attempt at a split. Checked hive #3 - no capped brood, no eggs, not a great deal in the way of stores apart from the super which is about half full. The queen cell I noted 3 days ago has not been vacated and there's now a second one. Decided to recombine with hive #2. Put newspaper above the second super, put the super from hive #3 on top, followed by the brood chamber. Removed two undrawn frames and put another frame that had some nectar on it the grass to be robbed out. Hive #3 - This hive now has loads of queen cells in the making, all over the hive, a few ready to release a queen. Still can't see any eggs and but there is frame of capped brood, a few of which I broke into and yes there are live bees in there. Looks to me like there is a poor queen and they are making superceedure cells. The problem is that I really don't want this 4th colony so I should combine it into hive #2. I moved the hive nearer to #2 for this reason but will ponder it some more before doing it. Hive #3 - took advice on this hive at yesterday's local beekeepers 'out day' and went back in today looking for multiple eggs. In the event I could find no eggs at all. But there is one frame now with a good pattern of capped brood. Lots of queen cells in the making too, most of which I removed, but not all. Maybe they are planning to supercede the queen. With good reason - there are larvae scattered all over the place. Plenty of bees and the super is filling, so this colony certainly has potential. Will not be back in for over a week now, by which time things may be a lot clearer..
Hive #4 - had a quick look to see how they were getting on, 1st frame full of stores, 2nd frame with loads of eggs - obviously doing well so boxed it up again. The 1st super is getting pretty full and the second super being worked on so I added a 3rd super. Loads of bees in there, I predict a population explosion! * The 4 brood frames I'd placed on the lawn for cleaning a few days ago were picked clean. Bees certainly appreciate free, ie effort free, food. So I now know how to deal with excess brood frames after combining colonies. * I am amazed at how successful bees are at creating laying queens. Out of the 5 queenless colonies of 3 weeks ago 4 are now laying. And the 5th colony was probably rendered queenless by my interventions. Makes me think I should worry less about their swarming, simply put the effort into preventing multiple casts. Nuc #1 - two frames not drawn out yet. I gave them a feed yesterday as it had been so wet all week and it had been taken down. Larvae and eggs visible, good lay pattern. Boxed it up and can forget it for a few weeks now. Hive #2 - still three undrawn frames, eggs & larvae and good brood cells. 1st super about half full, second fairly light. Plenty of space so can forget these too for a few weeks. Hive #3 - larvae visible in a random pattern over several frames, no sensible brood patter. Looks like laying workers so need to think what to do about that. But no point combining with another hive. Hive #4 - removed the large frames from on top and placed them a few yards away, they can be robbed out by whoever is interested. Didn't check the brood chamber as I thought I'd disturbed them enough. Need to go back in in a few days but monitoring weight & brood temp should give some indication of what's happening. Beebug repaired, it had taken in water and there were dead bees inside. Dried and cleaned it and it's back on line. Hive #4 - paper has been chewed through and no dead bodies so combination assumed successful. Re-organised things to try to get rid of top brood frames. Build is now brood/excluder/super 1/super 2/ crownboard/twosupers with three brood frames for cleanup (hopefully). The other brood frames have been spread around and a few old ones will be melted down. Hive #2 - eggs discovered on the third frame in so I boxed them up again and hopefully they will develop into a good colony. Brood chamber filled up as it was 3 frames short and there are now two fully framed supers. 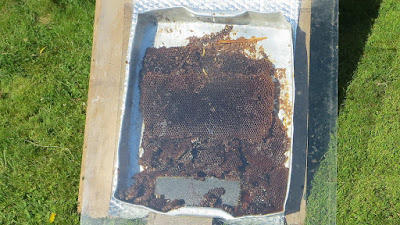 Hive #3 - not looking good, no brood/larvae or eggs and no purposful pattern to brood cells. Could not find the queen cell that was there two weeks ago, taken down for some reason. There could of course be an unmated queen in there but I doubt it. Give it another week then combine with #2 if still no eggs. 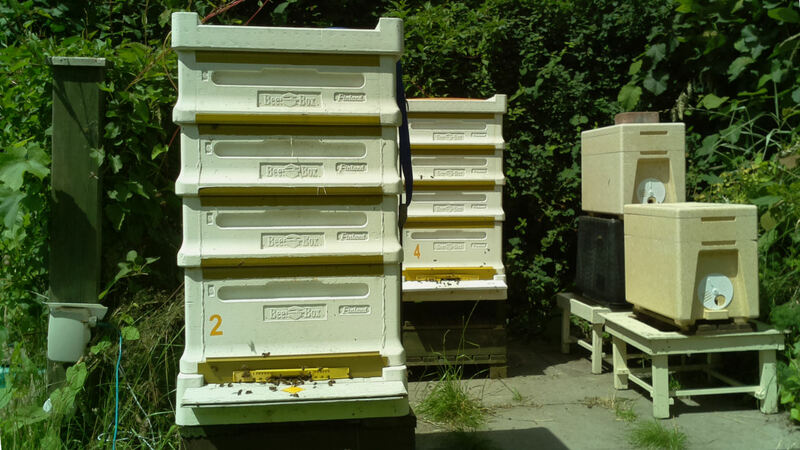 Nuc #1 now at rear right of apiary having been walked there at 3 feet a day over the last week. Completed the combining of Hive #4 into Nuc #1 in the early evening while it was quiet. So both colonies are now in Hive #4. Realised I should NOT have fitted an excluder as the drones can't get through so added a roof extender with a gap in it so they can get out. Two layers of newspaper should slow them down a bit. Did some preparation work for recombining hive #4 with Nuc #1. Hive #4 moved off the measuring system plinth and onto a standard plinth. An embpy BeeBox hive was then placed on the measuring plinth and the frames from the nuc transferred across. Has a quick look at them and there are loads of eggs and some young larvae too. Added 4 empty frames to make up the hive brood chamber so they have a lot of room now. Added an excluder but no super. Will leave them a day or so to settle before combining. Had a quick look at Nuc #2, the one with the waring queens and there are eggs on the second frame already, so boxed them up again. So that's about 10 days from emergence to laying eggs - pretty good. What I do with these will depend on how hives #2 and #3 come on with laying queens. But as things look I have two out of five hives with new queens and two hives with the potential to come good. The weight build up on hive #2 is encouraging, they could well have a mated queen in there. But I'll leave it a week before diving in. Hive #4 loosing weight rapidly over last few days so went in to explore. The queen cell I noted on 26th May is still there so looks like a dud . There is no larvae or brood and can't see eggs - looks like a doomed colony. Took off two supers to reclaim the boxes for possible recombination use. Nuc #1 - lots of eggs on second frame (didn't look any further) and loads of stores, so looking good. But very congested, they need a new home and I don't have a brood box spare. So decided to shift hive #4 into two supers on a false floor and take their brood box. They were not pleased. Taking everything off the load cell platform for a minute gave me a chance to check the zero offset, which showed on the ThingSpeak weight trace as 0.9Kg - pretty good! Next stage is to move nuc #1 into the brood box, then combine the two colonies. Hive #3 Thought I'd check to see what was going on. I had the thought that the lost swarm of last week could have returned to the hive. Howeveer the evidence doesn't support that idea.The queen cell I left a week ago has been vacated, and there are no others. There is plenty of old capped brood but no other sign of young. So hopefully the new queen will start laying in the next few weeks. Hive #3, checked progress on cleaning the extracted super - they've done a lot of repair work so I moved it down (now above the brood box) for them to use for storage. This has the swarm of 22nd May. Really heavy with bees. Didn't disturb the frames but they are all being worked on - new wax everywhere. Too soon for eggs so boxed them up, need to check in a week. This is the multiple queen cell nuc and at least a dozen cells have been vacated and a half dozen still unbroken - but the queens could have been stung. Plenty of busy bees in there, plenty of stores & some brood. Boxed them up, need to check for eggs in a week. I couldn't see any queen cells yesterday after it had issued a swarm so had another look - and found one, and only one which is good news. So expect a swarm if I missed one or a mating flight during next week perhaps if I didn't. Four foundation frames in the brood chamber so no congestion pressure, and I gave them a super of extracted frames to clean up last night which is keeping them very busy. A lot of high level zapping around from hive #4 today, could be a mating flight in progress. Need more warm, still weather to get all the queens mated. Went to collect the honey spinner and when I arrived back at mid-day the air was full of bees - hive #3 had swarmed. They settled in a nearby bush and I went in for a coffee to let them consolodate, but when I went down to collect them - all of 20 minutes later - they had gone! Spent an hour in various gardens looking for them but to no avail. So there goes my last queen. I now have 5 colonies and not a single mated queen. When I went in to check hive #3 for queen cells I couldn't find a single one. I suspect they were overcrowded and desperate to swarm, hopefully there are some eggs for them to play with. When I transferred the nuc to the brood box I didn't add a super - a mistake I now think. Honey extraction completed at 1am! Checked hive #4 and couldn't see where a swarm queen could have emerged, however did find a big queen cell that looks ready to pop, in the centre of the frame so could be a supercedure cell. Anyway, boxed them up again and hope to see a mating flight in the next week or so. Then checked hive #2 and couldn't see any larvae so looks like the queen could actually next door in what is now hive #3. Found a ripe queen cell in the centre then on the last frame found a dozen or more. What's more there was a lot of very audible quacking and piping coming off it. decided to box it up and ask advice - feeling out of my depth. Managed to get Ken Beddoe who advised removing the frame of queen cells to a nuc and just leaving the one queen cell. The queens can then fight it out in the nuc, I just have to let nature run it's course. While I had it stripped down a second time I pulled out 18 super frames for spinning. Bee mayhem. But the really good news is that I've captured loads of nice queen noise on my Raspberry Pi internet mic. I've now moved it to the nuc and set the software to take 30 second sound clips every 15 and 45 minutes past the hour. I'll then know when the battle is over. I also gave the nuc a litre of syrup for good look. A very exciting two hours. Back off holiday and decided to see how the Nuc was doing. On opening it up I was surprised at how many bees there were - far more than last time I looked. They seem to have demolished the capped queen cell I put in on 16th May. And there are a lot of young grubs on at least two frames, which I think means either the queen is in there (I was sure she wasn't) or some workers have started laying drones. Anyway I moved the colony into more spacious accommodation in a spare BeeBox unit. They are now colony #3 as that's the number on the brood box. Will check further in a few days. Tomorrow I'll look for evidence of the queen in colony #2. Maybe she'a a quantum queen, capable of being in two places at once, but I suspect the answer is more prosaic. Gave them a feed as it's quite cold. Here's a weight plot from hive #4 showing a second swarm (1st was 9th May). It was quite early at 10:30am - a bit one too, at 2Kg. I was sure there was only one queen cell in there so can't understand it. As I'm in a caravan in Norfolk there's not much I can do. However I contacted a beekeeper neighbour who captured them on 23rd and put them in a nuc for me. Remote beekeeping! Following on from advice at yesterday's KBKA apiary visit, I checked out hive #2 for queen cells. Found about 4 uncapped and three capped. None of them really long so I wonder if they are swarm cells or emergency cells? Without finding the queen it's anyone's guess. I destroyed the non capped cells and moved the capped ones into the nuc which is showing no signs of making their own. So as usual, I take recommended action but am left wondering if I've done more harm than good. I think the only way forward here is to get my queens marked. If indeed I have any! Some external observations. Hive #2 looking normal and active from the outside and they are putting on weight, so I think there's a good chance the queen is in there. Unike the nuc which has very little activity - no flying bees of course, but if the queen had been in there a lot of flying bees would have returned to it. So looks like I might have got it right. Gave the nuc a second litre of syrop, first had gone. Internal brood temp holding up. A hot day forecast and I have a feeling that today hive #2 will swarm! Decided to do s split, but rather than take out the queen I took out the brood and NOT the queen. Net result is the same as Pagden method if I get it right and I do't have to swap hives around. Spotted a capped queen cell which I removed and two uncapped, so I left just one. In the remaining colony I didn't spot any queen cells and just left them one frame of brood. So all the flying bees should carry on as before - pulling in the forage but there will have to be a lot of work expended building up the comb on the six undrawn frames I put in. I noticed a few bees on the original landing platform in bims up mode so hopefully the queen is in there. The six brood frames are in a nuc with loads of nurse bees. Gave them a 1 litre feed. Decided to check the nuc this morning, no queen, I think even I could have spotted her. Lots of drones I noticed. So my gamble didn't pay off, and I've put the nuc frames back in the main hive. I also added a super (6Kg for the record) of empty frames as the hive is so productive. My strategy now is to let it swarm, then hopefully get the swarm. The colony is so strong, hopefully it will soon recover. Warm weather at last and both hives have been pulling in lots of food these last 5 days, upto 2.5Kg a day, so I'd planned an inspection for tomorrow. However, as usual they are ahead of me. Hive #4 swarmed at 12:30, classic time. I caught them in next door's garden, boxed them and left them to settle while I sorted out the original colony. I destroyed two capped queen cells and left several uncapped. I need to go back in after 6 days according to my book, check there is a capped cell ready to hatch. I then prepared a new hive for the swarm and collected the box from next door, tipped it up but nothing came out - they'd absconded! Spent a hour patrolling the neighbourhood but to no avail, they could have gone quite a distance second time round. Let that be a lesson to me, box them up straight away! I decided to inspect hive #2 and as expected there were plenty of uncapped queen cells. The two supers had significant stores I noticed. Anyway I decided to pre-emp a swarm by splitting. As I can never find the queen I worked in from both ends and hoped that the queen was in the two remaining in the middle. I put these together with two food frames and two raw foundation frames in a nuc. I have read that you can tell which hive has the queen from the activity at the entrance. Nothing obvious to my eyes however. I'm hoping it won't matter, either hive hopefully has the wherewithall to make a queen. We'll see. Hive #4 - extra super added to allow feeding again in view of ongoing cold weather. A litre of syrup given. A second super with a mix of drawn/undrawn frames added to each hive. An extra 3.2 Kg on the weight chart. Both hives checked before going away for a week. Same report for each. Plenty of bees pulling in pollen, but a lot of DWV too. Bees very calm. BeeBug moved below hive and top super removed together with crownboard. Water ingress around crownboard needs to be addressed. Feeder removed, all feed and fondant taken. No significant stores in super, but wax being drawn. Didn't see any point in checking brood chamber. Ventilation gap introduced below top. 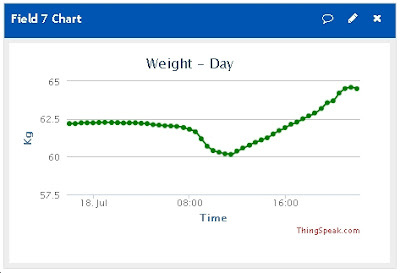 Weight from Beebug not increasing yet. So very different from last year when the weight was going up from early April and I had swarm problems at just this date in April. Can't see them swarming this year for at least a month. Both hives have had three feeds of 1kg of syrup over the last two weeks. Much needed in view of the cold weather. 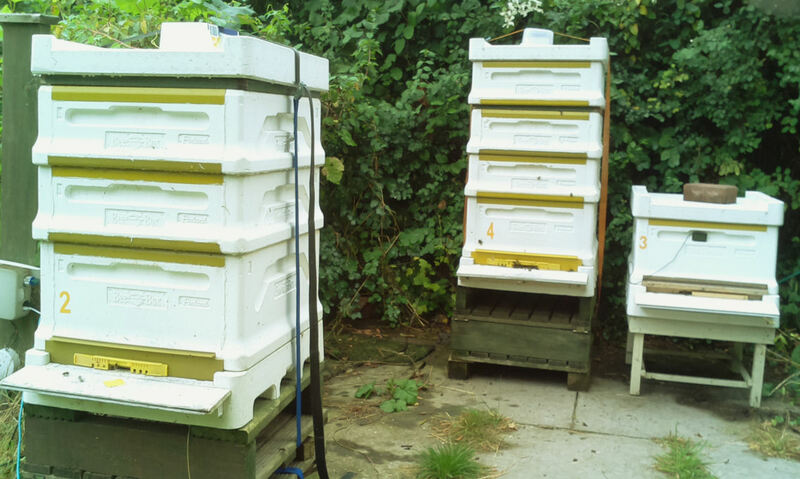 Ignoring the feeds, the hive weights are still on the down, in spite of the bees pulling in loads of pollen. Presumably not enough foragers/not enough nectar about. These two curves show the picture, the three feeds can be seen at the right. Hive #2 inspection has been delayed by cold weather but managed it today. Small amount of food in the super and they are starting to draw out some foundation. The brood chamber itself had lots of capped brood (over some 5 frames) and visible larvae. Good store of pollen and both capped and uncapped honey. No obvious signs of disease apart from possible problem with brood with high dome on the 2nd frame. Must look that up, A dozen or so bees on the ground with DWV. All the Apigurad I gave them on 12th March had gone. Changed two frames for a undrawn new ones. No sign of wax moth. Plenty of bees and they were very tolerant of my intrusion, only used the smoker to drive them down. Gave them a good dusting of icing sugar, may help dislodge a few mites. Didn't see the queen. Put the excluder back on, then the near empty super. Gave a litre of syrup to both hives..
Outside temp up to 14C so carried out first inspection since 23rd September last year - over 6 months ago! First surprise was total absence of food in the super, so about 10Kg had all been taken down, all frames well cleaned out. The brood chamber itself had lots of capped brood (over some 6 frames) and visible larvae. Good store of pollen and both capped and uncapped honey. No obvious signs of disease apart from a few bees with DWV. All the Apigurad I gave them on 12th March had gone. Removed 3 slugs and changed one frame for an undrawn new one. No sign of wax moth. Plenty of bees and they were very tolerant of my intrusion, only used the smoker to drive them down before replacing the super. Didn't see the queen. Put the excluder back on, then the empty super. Gave them a 1litre of heavy syrup mix to get them started on drawing out comb. A calm day with air temperature up to 12C so decided to check the supers to see if the queen had been up there laying. For both hives there was no evidence of brood, quite a bit of uncapped honey, several frames with capped honey, and plenty of bees. I added 3 undrawn frames to the centre of each super to fill them ready for the honey flow. So that's 3x175gm onto the weight). I had noticed a half dozen or so bees on the ground with DWV so there must be a lot of Varroa in there. So I've put an Apiguard treatment above each super. Only had one tray left so split it between the two. The DWV is concerning but on the plus side it tells me that there are new bees being produced. Difficult to say which hive the deformed bees are from but I think it's #2. After two weeks of real winter we have a warm spell and the bees are flying from both hives. There is even a small amount of pollen going into each and the temperature probe in the brood chamber is showing 32C for hive #2 and 28C for hive #4. Last week hive #4 was showing only 6C so I was very concerned about it. The change-around in a few days has been amazing. I gave them both a treat today - a blob of honey, which went within 20 minutes! So, All good news. On 1st Jan both hives moved a few feet and re-oriented to allow better access and future addition of hives for swarm control. Both colonies are looking good, sitting out the remarkably mild winter. Brood temperatures below are not that significant as it depends where the bee cluster is relative to the temperature probe.